Zoom Corporation introduces the board that does more, the LiveTrak L-20, perfect for bigger, bolder arrangements. 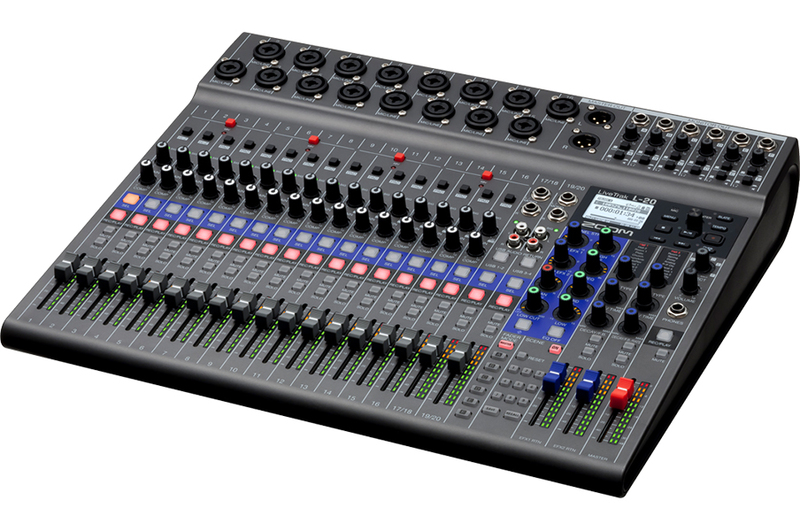 The L-20 boasts 20 inputs including 16 mono mic/line inputs and two stereo inputs. All inputs feature a 3-band mid-parametric EQ and the 16 mono mic/line inputs offer stand-alone compressor control. Musicians can also record up to 22 tracks (20 discrete channels plus a stereo mix directly) directly to an SD card for at-home editing. The LiveTrak L-20’s six independent monitor outputs give each musician control over their own custom headphone mix, complete with effects. All outputs can easily be switched from a powerful headphone output, to a balanced line output for stage monitors. The L-20 also provides a dedicated 7th output just for the FOH engineer, enabling them to monitor the main mix as well as all sub mixes. The Zoom LiveTrak L-20 will be released this summer.